No more solar flares, no more boots-only shots, and maybe now there'll be some Facetime because Superman will finally be seen on 'Supergirl' as casting has begun to fill those Kryptonian tights. During the first season of 'Supergirl' on CBS (now moved to the CW) Superman appeared via texts or as a child to his cousin Kara (Melissa Benoist) but now the television version will simultaneously exist with the movie version played by Henry Cavill. This should cement the idea that both mediums will remain separate entities so there won't be any movie/TV crossovers. The move to the CW joins other Berlanti-produced DC Comics shows, The Flash, Arrow, and Legends of Tomorrow. A huge 4-show crossover is expected involving Supergirl in December. Who will they cast as Superman is now the question? Will Smallville's Tom Welling reprise the role? Could it be that Matt Bomer (White Collar), who's done the voice of Superman in animation, finally get his chance after rumors of playing him for years in live-action? Considering the wonderful job David Rappaport has done casting the CW shows it probably will be a fresh, chiseled face with either a background from Broadway or Glee. Or not. Let the fan casting begin! 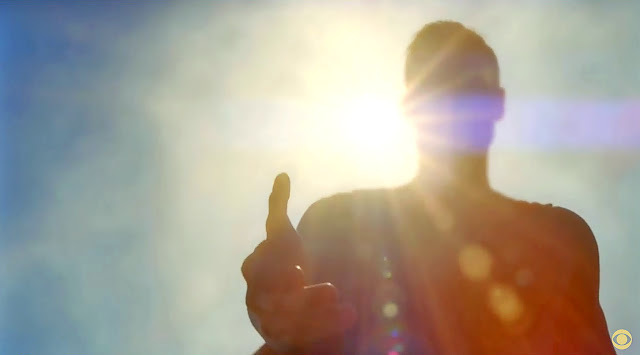 Supergirl will return Mondays this fall at 8 p.m. ET on The CW.